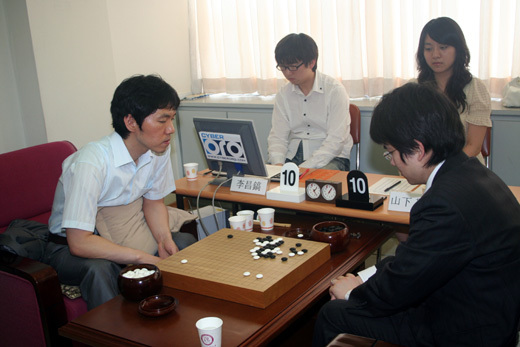 Takao Shinji, the challenger in this year’s Honinbo Title, won game 5 by resignation in 167 moves. Hane Naoki, title-holder, is still just one win away from keeping his title, as he leads 3:2. Game record here. 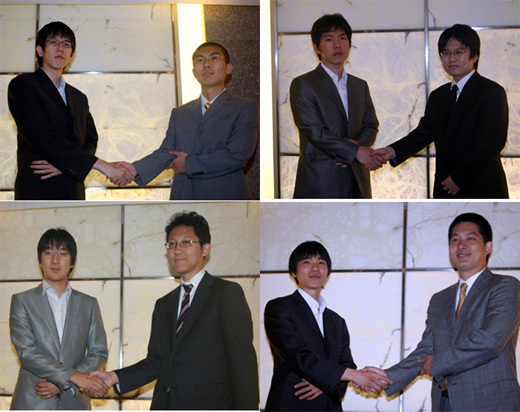 The Japanese Gosei title started yesterday. Title holder is the amazing Cho U, who, besides Gosei is title-holder in Meijin, Judan, Tengen and Oza and is also the current Agon Cup winner in Japan. Cho U captured the Gosei title from Yoda Norimoto in 2006, and defended it successfully against Yokota Shigeaki in 2007 and against Yamashita Keigo in 2008. The challenger this year is Yuki Satoshi 9 dan. He qualified to challenge Cho U after defeating Morita Michihiro, O Meien, So Yokoku, Takemiya Masaki and Iyama Yuta. 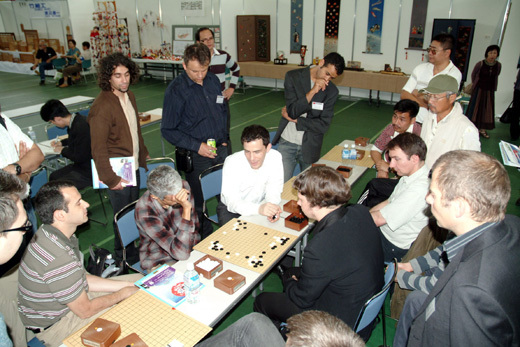 Gosei is one of the seven major Japanese Go titles, and the final is played in a best-of-five system. Cho U won this first game by resignation in 143 moves. The second game will be played on July 10th. Complete tournament table here. More photos here. Chang Hao of China defeated Lee Changho of South Korea 2:0 in the final of the international Chunlan Cup. This must have been particularly pleasing for the sponsor, since Chunlan is a Chinese company. Here is the game 1 record. Chang Hao, playing black, won by resignation in 241 moves. 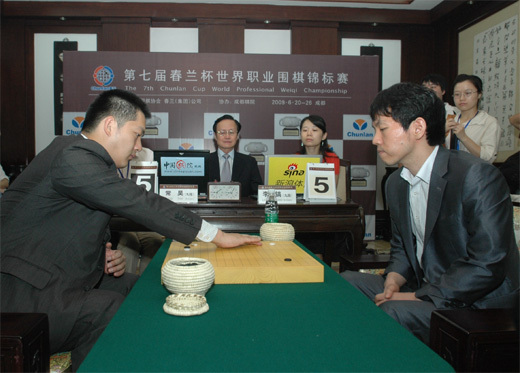 Here is a photo from the beginning of game 1: Chang Hao is on the left hand side. Chen Zude, one of the veteran Chinese professional players, is watching the game from the referee table. And here is the game 2 record. Chang Hao, playing white, won by resignation in 176 moves. In the playoff for the 3rd place, Kong Jie of China defeated his countryman Zhou Heyang. Complete tournament table here, and more photos from this final here, here, here and here. 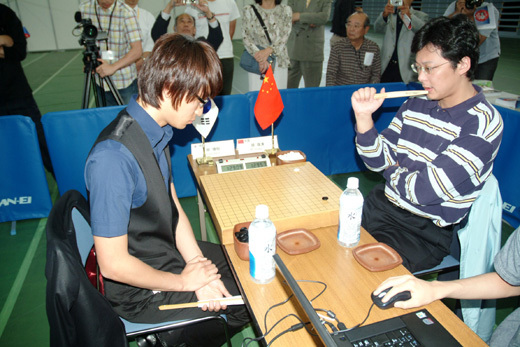 Hane Naoki, the title-holder, won game 4 in the Honinbo title match. He is leading the challenger, Takao Shinji, by 3:1 and only needs one more win to keep the title. Here is the game record. Tournament table here. 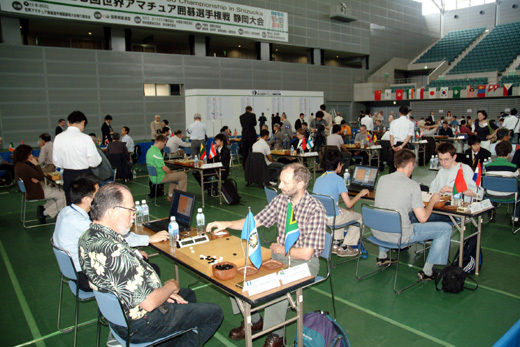 Webpage (in Japanese) of the sponsor for this tournament, Mainichi newspaper, including more photos here. Kong Jie defeated Lee Sedol in the final of the 21st Asian TV Cup. To qualify in the final, he also defeated Kang Dongyun and Lee Changho. 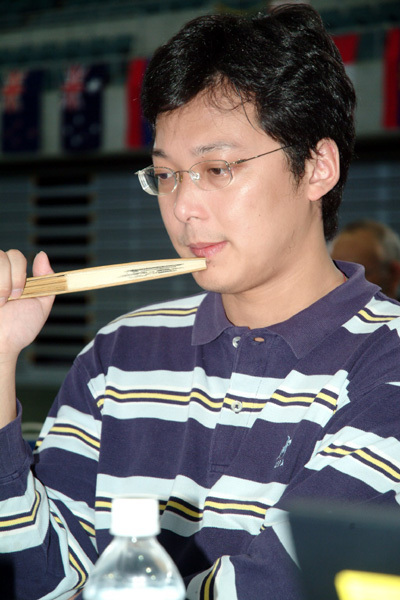 Interestingly, Kong Jie started this tournament as a 7-dan. He earned promotion to 9-dan after defeating Lee Changho yesterday to qualify in the final. 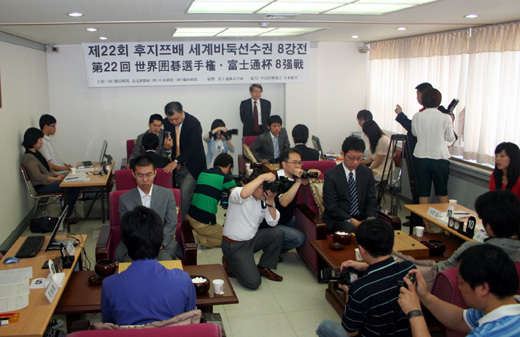 Lee Sedol won the previous two editions of this tournament. He recently announced his one year and a half retirement from professional life. Here is the game record of the final. 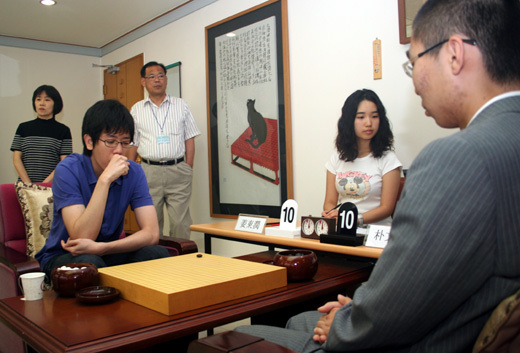 Hane Naoki, Honinbo title holder, won the third game of the Honinbo title. He is leading 2:1. Photo of Takao Shinji handing the sealed move to referee Rin Kaiho at the end of day one. Game four will be played on June 18, 19. Tournament table here. 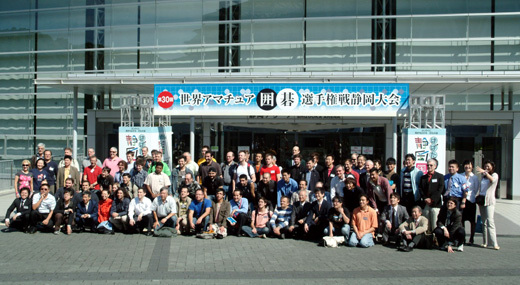 Mainichi webpage (in Japanese) here. The Fujitsu Cup quarterfinal stage is over. Both Japanese players were eliminated. Korea has 3 players and China has 1 player in the semifinal to be played on July 4th. This is a particularly sad even for Japan, since Fujitsu is a Japanese sponsor. Here is the game record between Lee Changho and Yamashita Keigo. And a short video from the beginning of this round. Rui Naiwei and Jiang “Jujo” Zhujiu commenting the Chang Hao vs. Lee Sedol game. Lee Sedol doesn’t look too upset with his loss. The quarterfinals of the international Fujitsu Cup start today. Pairings: Kang Dongyun(Korea) – Piao Wenyao (China) Lee Changho (Korea) – Yamashita Keigo (Japan) Kono Rin (Japan) – Park Yeonghun (Korea) Lee Sedol (Korea) – Chang Hao (China) Incidentally, this will be one of the few chances to see Lee Sedol play in official games until 2011, since he decided to retire from the professional life for a while after several incidents with the Korean Baduk Association. Tournament table here. 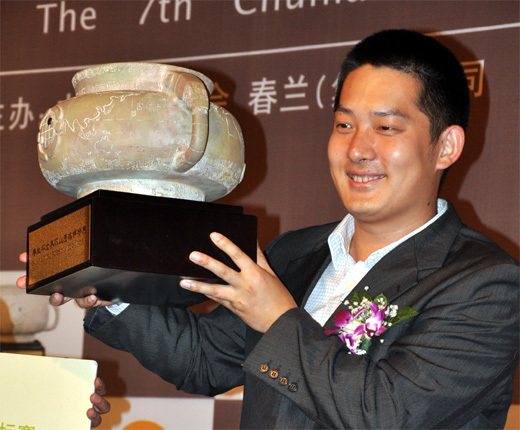 Yuqing Hu of China repeated his 2005 performance and won this year’s World Amateur Go Championship (WAGC) with a perfect 8:0 score! Yuqing Hu’s most difficult game, according to a Ranka interview with him, was the one against Shin-Hwan Yoo of South Korea. 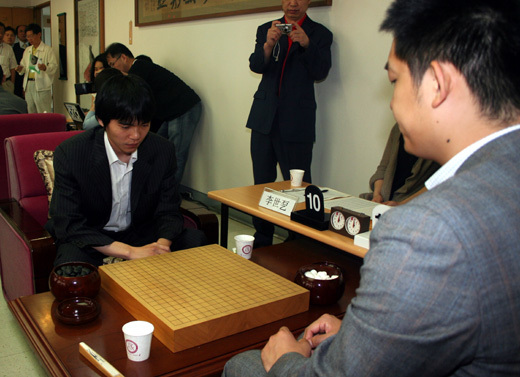 Here is a photo of the game between the two (Yuqing on the right hand side). And this is the game record between China and Korea. You are currently browsing the 361points.com/blog blog archives for June, 2009.